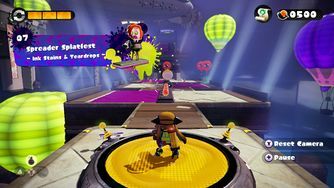 For the multiplayer event of a similar name, see Splatfest. Spreader Splatfest is the seventh mission in Splatoon's single-player mode, Octo Valley. It gets its name from its heavy use of Spreaders. When Advanced to Area 2, Mission 7 can be found in the Southern east of the area on a small tower. There is a pathway, which is inkable and immediately after, there are the spreaders. These move across surfaces spreading ink. You can either ink on top of the spreader, or wait until it reaches one end, and then swim across quickly. 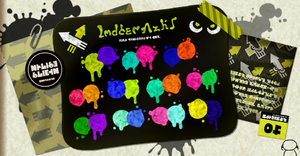 There is a second spreader which has a balloon fish on, which you can use to ink the surrounding area. Again, swim across, and this time there are two paths, it doesn't matter which on you move to. There is an Octotrooper on the next spreader. Take this out then make a path through. You will then come up to a wall you cannot climb without the use of ink. Ink the path then swim up. Then hit the inkrail, then swim on it. Straight after the checkpoint in a crate is the first piece of armor for this level. After you have shot ink at the crates blocking the path you need to take out the Octocopters. There is then a spreader on a wall, you need to make a path up, to get over the wall. 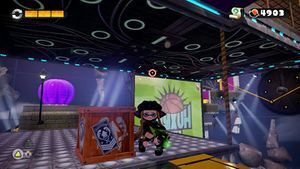 After completing this shoot ink at the crates and then take out the Octotrooper that emerges from the ink to make the path easier. There is another spreader on this wall, as before make another path up and quick. To help you there is a balloon fish you might need to ink to help get up the wall. Turn straight around and ink the start of the Inkrail, which will take you to checkpoint 2. There are a set of spreaders straight past the checkpoint start, which go around the platform in a circular motion. There are then some circular platforms that you can step on to help kill two Octocopters. It doesn't matter if you fall, because there is ground beneath you. Take the two octocopters out. After this there are another two spreaders going in a circular motion. Jump onto one of the spreaders. Then jump straight on to the platform and splat the box to get the sunken scroll. Then, hop back on to a spreader, then jump off on to the platform. Shoot the octocopter blocking your path. There is now a big wall you need to climb. Ink a path straight up to get past. Hop straight down off the wall and destroy the two octocopters. There are now two platforms which contain several enemies. Take them out, to make it easier. Hop onto the launchpad. In this final checkpoint, there are four spreaders, two with an Twintacle Octotrooper on, two with a Shielded Octotrooper on. In the middle there is a balloon fish, and, if you want an easy time, splat them, make a path over to the zapfish and claim it. Location: At the second checkpoint, under the platform after the drop. After hitting the checkpoint, go past the first obstacle and get rid of the Octocopters after the small drop. Face the walkway constantly being scrubbed over with purple ink. Hop on one of the platforms scrubbing the ink and ride it beneath the walkway, facing the platform you were just on previously. jump off and collect the scroll. Armor 1 Location: Straight after checkpoint one, in a crate. Armor 2 Location: Straight after checkpoint four, in a crate. Boss: Enter the Octobot King! This page was last edited on 6 April 2019, at 19:57.